Why should book authors cooperate with HabitCoach? Self-help books are all about action. Reading a book is simply not enough. 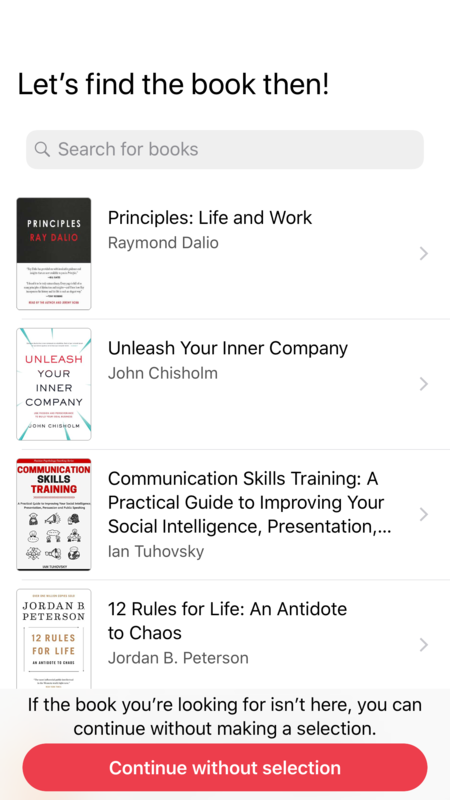 Many self-help books already have a section (or even a whole chapter!) that talks about the importance of taking action. But just talking might not be enough. Isn’t it better to give the users a tool to practice the principles from the book right after they finish? HabitCoach has been created for exactly this purpose: to help the users put any self-help book into action. There is great value for all three parties when book authors cooperate with HabitCoach. Book authors gain an additional revenue source and an additional channel to promote their new books and other products to their followers. The users gain a tool where they can easily put into action all the great ideas described in the book. HabitCoach is willing to give you 30% of all income from the users you bring in. This 30% comes from the cost of premium accounts, minus the fee that the App Store and Play Store take for themselves (they take 30%). Currently, the estimated conversion from app install to purchases for a user who came to the app due to the recommendation of an author is around 5-10%. This means that you can earn up to $1 for each book reader that installs the app (this number is very dependent on the type of book, and how much you inspire the reader to put your book into practice). Around 70% of the users that install HabitCoach give us permission to send them the newsletter. We know exactly who installed the app from the author’s promotion, and we can send those users any newsletter that you want. For example, we can send a newsletter promoting your new book or your events. You can send at least one newsletter quarterly to your followers. If your book is very good, and we like it, we may promote it to all of our users. We will do this through newsletters or by placing your book in a top position on our list of recommended books. As we have certain criteria for a book to be promoted, we cannot promise this promotion for all authors—please talk to us for more details, and keep this in mind as a possible opportunity. How do we know if a reader came from your book? There are two ways that we know. First, at the beginning of the registration process we ask the new user how he or she heard about the app. If the user chooses “A book or an author”, we ask which book. The second way is to offer the readers a promo code. With the code, they get a 30% discount on a premium subscription (or any other discount that you think is reasonable). This type of promotion is good for true followers if you really want to help them by giving even more value. Promoting it on social media, in newsletters, etc. We highly recommended the first method. When the users are in the midst of reading the book, it’s their moment of highest excitement and they have the most willpower to take action. If we show the users that they can easily practice the ideas and principles in the book, there is a high possibility that they will do it. We created an example chapter that you can include in your book. While creating it, we kept in mind the most important thing: the value it will bring to the reader. 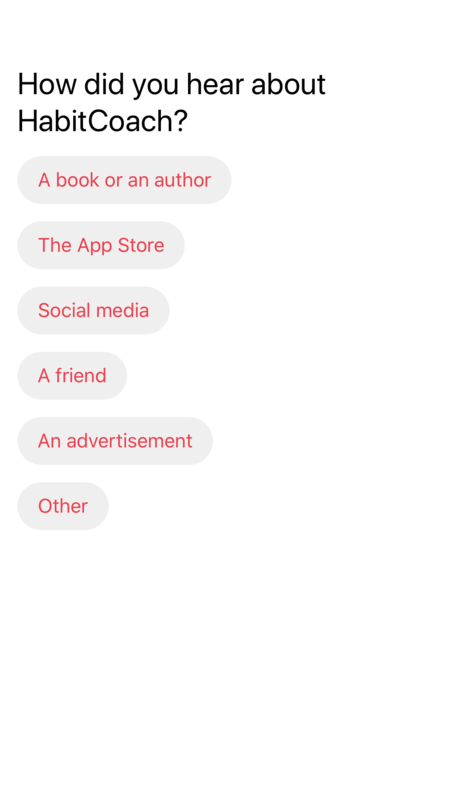 It’s written in a general way, so adding more specific content related to your book will further motivate the reader to take action and install the app. Adding a story about how this app may change one's life would be even better. We will provide you with a special page where you will be able to observe the full statistics of the users that you brought to the app. This includes the app installs and the app purchases. It’s the nature of HabitCoach that we need time in order to process a book and add it to the app. We need approximately one month to publish a new book in the app. In rush circumstances, we are able to accomodate two weeks, but it is not possible to process content any faster because we need to ensure superior quality. If you, as an author, decide to cooperate with HabitCoach, contact Greg: greg at taulab.com. We will sign a formal agreement. The terms and conditions will be available online (these are the same for each book author). The company operating HabitCoach is registered in Estonia, and it’s called Taulab OU.